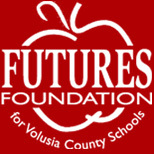 FUTURES, Inc. d/b/a FUTURES Foundation for Volusia County Schools is a tax-exempt 501(c)3 nonprofit organization. You will receive a gift confirmation and a tax receipt via first class mail. A copy of the official registration #CH10078 and financial information may be obtained from the Florida Division of Consumer Services at www.FloridaConsumerHelp.com or by calling toll-free 1-800-HELP-FLA (435-7352) within the state. Registration does not imply endorsement, approval, or recommendation by the state. No portion of any contribution is retained by professional solicitors, so 100% of each contribution is received by this organization. All or part of your gift may be tax deductible as a charitable contribution. Please check with your tax advisor.